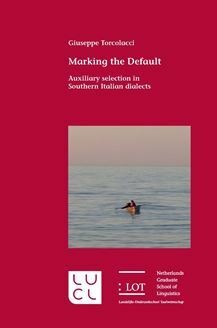 This dissertation focuses on the overt marking of φ features encoded on perfective active auxiliaries in a group of Southern Italian dialects. In the geolinguistic area that stretches from central Apulia-Campania to northern Calabria, present perfect and pluperfect auxiliaries generally exhibit different strategies as far as the overt marking of φ features is concerned. In these dialects, 1st and 3rd person present perfect auxiliaries are morpho-phonologically more marked than those expressing 2nd person. Conversely, pluperfect auxiliaries expressing 2nd person are morpho-phonologically more marked than those endowed with 1st and 3rd person. Our assumption is that these types of φ marking strategies depend on the application of a post-syntactic mechanism called Default Marking, according to which φ features encoded on perfective auxiliaries get overtly marked only if their grade of markedness is the same as that expressed by the feature Tense. We propose that the Default Marking operation is at play also with definite determiners and demonstratives, as well as with modals. On the other hand, Default Marking does not operate with lexical verbs. This is due to the fact that Default Marking is active only with (a subset of) functional heads that license periphrastic constructions.